The Cibolo Creek is a treasure that arises from springs on the outskirts of Boerne and meanders 100 miles southeast to its confluence with the San Antonio River. Alternating from shallow, rocky flats to deep, mossy canyons and sprinkled with scenic falls, the spring-fed creek offers stunning scenery and opportunities for every type of nature lover. In the waters, catfish, sunfish, and Guadalupe bass tempt anglers. All around, cypress and live oaks create a canopy of life overhead for birders to enjoy. Cibolo Creek provides critical recharge for both the Trinity and Edwards aquifers, the vast underground reservoirs that are the primary sources of water for the Hill Country and the City of San Antonio. 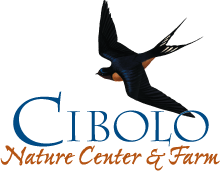 The Cibolo Nature Center created the Cibolo Corridor Conservation Initiative to protect and preserve the Cibolo Creek. The CNC works in partnership with The Nature Conservancy, Texas Parks and Wildlife, land-owners, businesses, state and municipal agencies and other conservation organizations to undertake the enormously important task of protecting this delicate watershed. Rapid development, population growth and the increased use of groundwater threaten the health of the watershed - and potentially threaten the people and wildlife that rely on it. Through collaborative conservation efforts, the CNC and its partners have protected nearly 1,300 acres within the Cibolo Watershed. And the Cibolo Corridor Conservation Initiative will protect many more acres and nearly five miles of sensitive groundwater recharge in the Cibolo Canyonlands. The Cibolo Canyonlands rise dramatically from the creek on the eastern edge of the CNC. A steady pulse of water over millions of years has carved deep, flowing paths through porous limestone cliff walls. Nearby, Herff Falls rumble. The creek is home to Guadalupe bass - our imperiled state fish - as well as the threatened Cascade Caverns salamander. 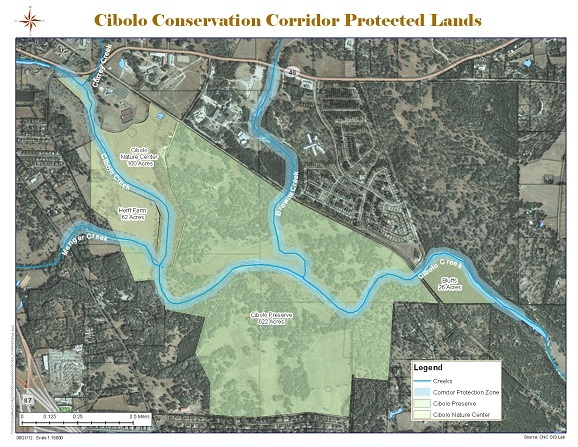 Through leadership, education, science and stewardship, the Cibolo Corridor Conservation Initiative protects the quality of life along the Cibolo Creek.